I am part of a Mom's group at my church and have enjoyed a year of getting to know a group of lovely ladies. Next week is our last official meeting before our summer break and I wanted to give them a small gift. 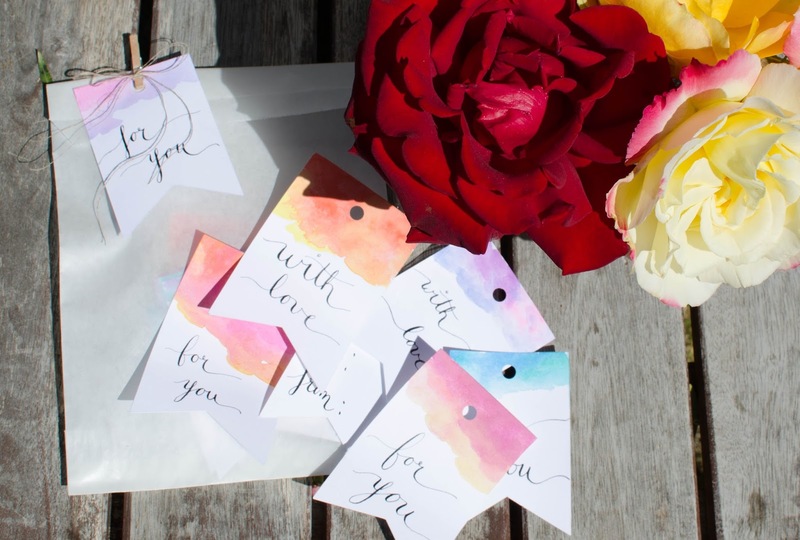 After a little experimentation, I settled on mixing some watercolors and calligraphy in the form of gift tags (have I also mentioned my obsession with gift wrap?). I'm sure it is probably weird to give a gift comprised of components to wrap another gift. My sister-in-law and I give such gifts to each other frequently, but she also shares my love of all things gift wrap. These tags were cut on my Silhouette Cameo using regular white card stock paper, though cutting by hand would work as well. Next came the watercolor painting. I'm new to the world of watercolor so it took me a little while to get the look I intended. Basically, I had to use a very wet brush and let the colors mix freely on the paper in a small pool. Once the right look was achieved I let a little of the excess water run off the tag onto a paper towel and set it aside to dry. Once all the tags were dry, I added various calligraphy phrases in all lower case letters using a Nikko nib and black ink. Once dry, I punched the holes and separated them into sets. 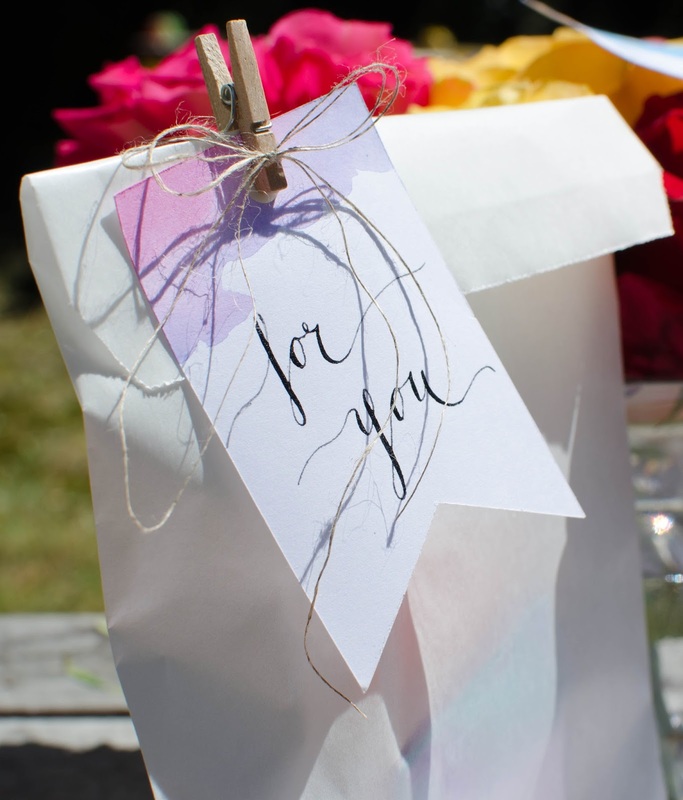 Slipping them in a glassine bag, pinning a gift tag on top, and adding a tiny twine bow wins you a few extra points for presentation. I know I would feel just a wee bit extra special if I got a gift with one of these lovely tags on it. I may have swiped one for a baby shower gift I am giving in a few weeks. Here is my very 'instagram-y' picture of how it turned out.